The Beagle ended the year charting the dangerous waters of the Chonos Archipelago with the help of the Beagle's tiny yawls in place of the Adventure. Christmas passed unrecorded and New Year introduced itself with a gale. Late on the evening of January 19th, the watch saw a light, like a bright star, which steadily brightened until 3 o'clock. By that time most of the officers were on deck watching. It was the volcano Orsono erupting. Through a glass they could see the molten rock arc through the sky like a shell. Shortly after, Darwin and King made an excursion by horse around Chiloé. Covington did not come along, but gleaned sufficient facts about the roads to comment in his Journal. .
A curious note on the cover of the Journal that fits here. It reads: "Tapacolo -- cover your posterior" and depicts a genus of shameless little birds, Pteroptochos, and what they do not do. Like the wagtail, tapacolo hold their tail feathers erect, giving them tremendous manoeuvrability in thickets near the ground where they chase insects like errant missiles, but exposing their downy nether parts. Hence the admonition, "Cover your posterior!" The Spanish name is more to the point. Beagle weighed anchor February 4th and headed North. This was the last time Covington would see this quiet, deep forested place. "If we forget the gloom and ceaseless rain of Winter," Darwin concluded, "Chiloé might pass for a charming island" [Barlow 1933: 271]. February 20th(169) we felt a very severe shock of an earthquake; this happened when we were lying on the ground, resting ourselves. The sensation was something like a ship in a gentle seaway, the trees could be perceived to wave a lot too and fro in a (53) north easterly direction; the sea came up of a sudden six feet, and as suddenly retired, but there was done here no damage. (170)Sailed from Valdivia THE 22nd OF February and arrived at Talcunano March 3rd. (171) Went to the Island of Quiriquina previous to ship coming to an anchor. This island is in the mouth of the harbour. In our going on shore we found the Island dreadfully cracked(172) the Island was also surrounded with the timbers and furniture of houses which had floated from Talcahuano. Left the island for the ship after dark. IT WAS about four miles, and in consequence of its blowing heavy, and both wind and tide against us, we were four or five hours before reaching ship, both cold and wet, the waves constantly breaking over the boat, and of course, drenched to the skin. A treat,(173) but nothing new. Went to Talcahuano the the following morning. We found the town in a most deplorable state, viz. not a single house habitable, (54) the earth cracked in all directions, roads blocked up with fallen rocks, cliffs shattered to pieces on the sea coast, fish etc. left on the dry land;(174) indeed, the whole country round spoke the devastation it had made. There is an unfortunate hiatus in the monologue here, of about seven months between the 23rd of February and November 26, 1835. This includes a tour of the northwestern coast of South America, the Galápagos Islands which Darwin made famous, and Tahiti, famous in its own right. The lapse in the text coincides with a profound change in Darwin's thinking, one stimulated by the enormity of the Chilean earthquake. It "at once destroys the oldest associations," says Darwin, "the world, the very emblem of all that is solid moves beneath your feet" conveying "to the mind a strange sense of insecurity" [Barlow 1933: 277]. Ships anchored in deep water ports were within minutes either aground or carried off; waves overtopped houses [Barlow 1933: 283] and towns lay in a heap like so many Andean mountain boulders [Barlow 1933: 284-5]. "In less than six seconds," relates Fitz Roy [Fitz Roy 1836: 320], the city of Concepcíon "was in ruins. The stunning noise of falling houses; the horrible cracking of the earth which opened and shut rapidly and repeatedly in numerous places; the desperate, heartrending outcries of the people; the stifling heat; the blinding, smothering clouds of dust and confusion...." Imagine if this has happened in England, Darwin mused [Darwin 1906: 292], the entire machine of government would be crushed! Minor shocks nagged them for weeks afterwords; smoke clouds appeared from eruptions in the mountains and fumeroles suddenly gushed from the sea bottom near Tomé and St. Vincente [Fitz Roy 1836: 324]. If that wasn't enough, near Concepcíon and "at Talcuhano the ground swelled like a large bubble, then bursting poured forth black, fetid, sulphurous water" [Fitz Roy 1839: (2)410-1]. As the tremors subsided, the tides refused to come back to their old high-water marks; at Santa Maria Island was pushed up nine feet [Fitz Roy 1836: 326]. Darwin, a hater of school geology, now felt a great urgency to understand its workings. During the next weeks he (and possibly Covington) would spend more time in the steep, rock filled valleys of the Cordillera. "As often as I have seen beds of mud, sand and shingle, accumulated to a thickness of many thousands of feet," Darwin admitted in his Journal, "I have felt inclined to believe that such causes as the present rivers could never have ground down and produced such masses." The mountians of Chile became a time machine encased in stone. Rather than go on in the Beagle, Darwin traveled by land along the coast and through the mining districts of Peru to Coquimbo, setting out April 27th with a guide. Covington may have come in this party. There is only a terse reference in Darwin's notebook "Passport, Covington instructions" [Barlow 1946: 231]. This could mean anything. They passed through mining towns, talked to the managers and stayed clear of the eccentric miners, whose habits were worse than those of sailors. Darwin met the Beagle May 26th at Coquimbo, but chose to continue traveling by land to Copaipó July 5th. Fitz Roy was gone: the Challenger, last seen in the Falklands, had sunk. She was dashed stern first against the rocks on the treacherous Dormido Shoal, off the Chilean coast [Fitz Roy 1839: (2)452-3]. Fitz Roy knew of hostile Indians there, and he all but commandeered the Commodore's ship for the rescue mission. Fitz Roy returned with all but two of the wrecked Challenger's crew on August 9th, leaving the wreck to the plunderers [Fitz Roy 1839: (2)459; Ritchie 1967: 211-5]. They anchored at Callao, the port of Lima (Peru), on July 19th and stayed for seven weeks. The city founded by Pizzarro the year after the defeat of the Incas was in little better condition than the Inca ruins Darwin spotted on the plain outside. Once a splendid centre of the Spanish Empire in the Pacific, Lima was a decaying city; it was a risk going into town. Chancing the robbers one drizzling day, they found "streets nearly unpaved, and heaps of filth piled up." A succession of revolutionary regimes had destroyed all order. Patriotic robbers would mingle "Liberdad Liberdad" with "off with your trousers" [Barlow 1933: 331]. The fortress of Callao, "which withstood Lord Cochrane's siege was about to tumble, demolished by the latest governor who could not find an officer to whom he could trust so important an charge" [Barlow 1933: 331]. On the other hand, there was Darwin's anxious note: "Everything exceeded by ladies, like mermaids; could not keep eyes away from them." 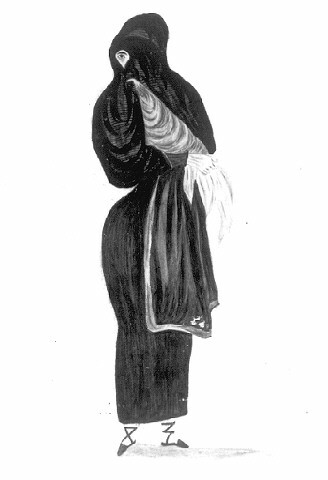 The women wore a long, black-lace mantle tied about the waist and covering the head, except for one eye. 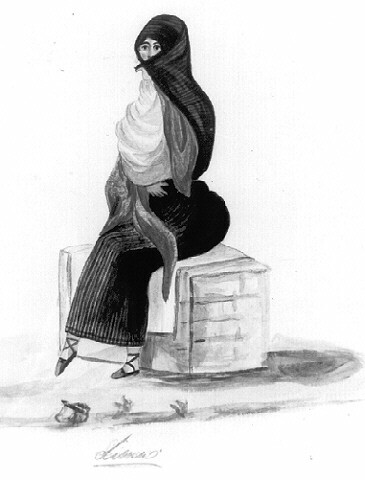 Modesty was cast away with "very white silk stockings and," says Darwin, "very pretty feet" [Barlow 1933: 332]. Exotic ankles were also in Covington's mind. Eight water colours come down to us from his stay there, seven of them are of these pretty ladies. On September 6th, Fitz Roy's latest purchase against Admiralty orders, a three ton tender, called the Constitucion, set off with Masters Assistant Usborne and Midshipman Forsyth to finish the survey of the Peruvian coast. They would then sell the boat and return to England as best they could. Next day, the Beagle sailed for the Galápagos Islands. The six week stay in the Galápagos, mainly for reprovisioning, is arguably the most important whistle stop in biological theory. The Galápagos Archipelago is a collection of rugged volcanic islands on the Equator some 600 miles (965 Km) West of Ecuador. Galápagos is Spanish for tortoise and for centuries the sailing vessels of all obtained tortoises (Geochelone elephantopus) as easily as picking melons, by rolling them onto their backs and dragging them to the saltworks, or else cooking them on the spot in their carapaces. So too the Beagle: on the 18th alone, the men brought back fifteen turtles. Capture was easy; the turtles -- like most animals here -- were as tame as pets. King claimed he killed a bird with his hat, and Darwin nudged an unflappable hawk off a branch with the tip of his gun [Barlow 1933: 334]. More important than meat was the water, and this being the wet season, they hoped to get their fill. But the porous lava sponged water from pools. The thirsty sailors were left with mere, tepid puddles. Covington went ashore with Darwin on the black lava of Chatham Island (Isla San Cristobal) on the 21st, but were driven back to the ship by the heat. Beagle visited to the tiny, but verdant community on Charles Island (Santa Maria), where they took their pick from the vegetable garden before continuing. On October 8th, they stopped at James Island (San Salvador) where Bynoe,(175) Darwin and their servants (Covington and H. Fuller the Captain's steward) [Fitz Roy 1839: (2)497] were put ashore for a week, while the Beagle went off looking for water. The small party ate tortoise cooked in its own clear fat and lived in "hovels" left by people from the Charles Island settlement. For water, there was a little well near shore, but a wave soon broke over and spoilt it. They would have been in trouble had not a Yankee whaler passed them three full casks and a bucket of onions. The sun and hot sand -- so hot you could barely walk over it in thick boots -- was exhausting them. They were glad to see the Beagle again on the 17th. What peaked Darwin's curiosity, and later rolled into his famous theory, was that the animals, though belonging to only a few groups, had diversified into a spectrum of species, depending on the island and the nature of their food. Little finch-like birds were all related to common American species, but differed in the shape of the beak. Different beaks gather different-sized seeds. This seemed evidence of the evolution of differently adapted species from a common ancestor. On October 19th they collected the last of the surveying parties and steered North for a quick look at two small, detached Islands of the group(176) before veering off across the Pacific [Barlow 1933: 343]. Distant 3200 miles at a steady 150 miles a day lay Otaheite -- fabled Tahiti. In early November they passed the atolls of the Tuamotu Archipelago, called the Low or Dangerous Islands because they were little more than reefs spread out over a large area. As soon as they anchored in Matavi Bay, near the famous promontory of Point Venus, they were surrounded by canoes, just as were other sailing ships over the years since Cook and Bligh. (177) But there were changes. It was Sunday on the Beagle, only because they didn't correct the log after passing the International Dateline. Thus it was really Monday morning November 16th. Were it a Sunday, the islanders would have waited a day before coming out -- there was a law against taking to canoes on the Sabbath. Drinking and other lax behaviour was also forbidden. The missions were here. Perhaps this is why Darwin also found the women less alluring than he expected from sailors' tales. While Fitz Roy busied himself with astronomical observations,(178) Covington and Darwin made a short journey inland. They left ship early the 18th with "provisions in a bag and two blankets. These were lashed to each end of a pole and thus carried by my Tahitian companions. From custom a man will walk a whole day with fifty pounds at each end of such a stick" [Barlow 1933: 348]. They traveled through the valley of Tai-auru, the main northward flowing river of the island. The valley became progressively narrower and by noon they were walking at the bottom of a cool, vertical ravine. Ascending the slope, they now viewed the country "from knife-edged ridges, the point of support was so small, that the effect was nearly the same as, I would assume, be observed from a balloon" [Darwin 1906: 3 96]. On the sides of precipitous valleys, "small ledges projected which were thickly covered by wild bananas, lilaceous plants and other luxuriant productions of the tropics" [Darwin 1906: 396]. They stayed the night, under an overhang to protect them from showers, a companion concluding the day with a long prayer in his native tongue [Darwin 1906: 395]. They kicked around the hinterland the next day, returning to the same spot to sleep. By noon on the 20th they were back at Matavi Bay, but faced a long walk down the beach to where the Beagle move d for watering. On the 25th, the day before leaving, the ship was trimmed with flags and all four boats were sent ashore for Queen Pomarre and her entourage. A large, expressionless lady, who we are told had neither beauty or grace, the Queen attended an evening of seamen's songs. After one salty tune she seemed miffed: It could not be a "hymni" [Darwin 1906: 400]. In this way, Tahiti was, for Darwin, "advancing in civilization" [Barlow 1933: 345]. Towards the end the evening, Congreve rockets were shot into the air above the crowds in Papiéte, to impress rather than frighten. "A deep 'Oh' could be heard from the shore, all around the dark bay, after each explosion" [Darwin 1906: 400]. Mr. El. (183) saw an instance of cannibality amongst them here a few years before our arrival; no preserved heads could be procured, although THEY ARE much sought for at this place. (184) (2') Their war canoes ARE very large and likewise use the matt sail. (185) As this is much colder than Otaheite, the natives were constantly bartering for blankets, FOR which, in return, they give matts, etc. Sketch by Syms Covington: 'Bay of Islands, New Zealand', reproduced courtesy of the Mitchell Library, State Library of New South Wales [Mitchell Library reference PXD 41 f. 2a]. Sketch by Syms Covington: 'Lima, 1835', reproduced courtesy of the Mitchell Library, State Library of New South Wales, and the Linnean Society [Mitchell Library reference PXA 290 no. 7]. Sketch by Syms Covington: 'Lima', reproduced courtesy of the Mitchell Library, State Library of New South Wales, and the Linnean Society [Mitchell Library reference PXA 290 no. 6]. Sketch by Syms Covington: 'Lima', reproduced courtesy of the Mitchell Library, State Library of New South Wales, and the Linnean Society [Mitchell Library reference PXA 290 no. 5]. 166 What impressed Darwin was that the town was "so completely buried in a wood of apple-trees that the streets are merely paths in an orchard" [Darwin 1906: 284]. 167 Covington never filled in the population; the Encyclopaedia Britannica estimated the population in 1875 to be 37,481. 168 They traveled around the bay, stopping at one disease ridden flea nest or another. Darwin complained that there was "not a space of a shilling" on his legs without its "little red mark where the fleas had feasted" [Barlow 1933: 273]. The Indians here were taciturn compared with those of Chiloé. Darwin was in the habit of passing out cigars (to women and men both) in order to smooth introductions. The people here "would hardly condescend to thank me," Darwin whinged, while "a Chilotan Indian would have taken off his hat and given his 'Dios le pagé.'" (May God repay you) [Barlow 1933: 276]. 169 "At half past eleven in the forenoon" [Darwin 1906: 291]. 170 The earthquake occurred at low tide: the sea came in, quickly but without waves, to the high-water mark, then retired. As Covington, Darwin and the others were resting in the woods, they did not see the Ocean. An old woman on the beach gave this seismological report [Darwin 1906: 288]. 171 Concepción Harbour [Darwin 1906: 289]. 172 Crossed out, "in a NE direction." The direction of the quake was such that the sides of buildings facing in the direction the ground wave buckled , while walls with their greatest length parallel to the wave, were more likely to survive [Darwin 1906: 294]. 173 Curiously put, but that is the spelling in the text. Perhaps 'threat' is meant. 174 Crossed out, "by the sea rising of a sudden and as suddenly returning." 175 The Surgeon was developing an interest in natural history. 176 One of these, Culpepper Island, was since renamed for Darwin. 177 The Bounty was on Covington's mind all right. We have an odd leaf with his pencil drawing of John Adams, the last surviving Bounty mutineer. 178 At the spot w here Cook witnessed a solar eclipse. 179 This was Aitutaki in the Cook Islands; 21°S, 161°W [Barlow 1933: 358]. 180 The Bay of Islands is at the North East tip of the North Island; they came ashore at the quiet mission of Paihia [Darwin 1906:401; Barlow 1933: 372]. This was the seat of government in New Zealand before it transferred to Auckland in 1841. 181 That is, the Church of England. A margin note on the previous page compares this with Otaheite which has "Methodist missionaries." 182 Darwin was put off by New Zealand, which he considered dull and desolate. 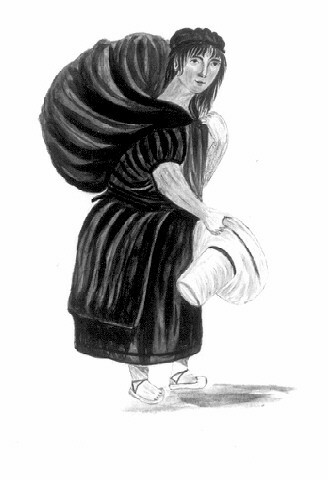 The indigenous people were mostly filthy, "the common dress being one or two blankets, generally black with dirt" [Darwin 1906: 405]. Their tiny "hovels" were compared with a "cow-shed with one open end" [Darwin 1906: 407]. However, at Waimate, a few miles inland, he found "redeemed" Maori, respectably dressed, playing a civilised game of cricket [Darwin 1906: 410], and this gave him some small hope for their future. 183 Refers to Robert Ellis (1794-1872), author of Polynesian Researches; Covington would have had the 1827 edition [Darwin 1906: 397]. 184 Stokes found some burnt human bones on a nearby island, and prayed it wasn't a recent meal [Barlow 1933: 358]. Readers will appreciate that Europeans were absolutely scandalised by anthropophagy, but they were also greedy to buy the smoke-dried, tattooed heads. 185 New Zealanders use a sail made of plaited rushes, like those on the outrigger canoes of Tahiti. 186 This was his elder brother, Joseph Matthews who helped found the Mission of Kaitaia, about 40 miles North West of Paihia. Kaitaia was said to be a pretty place, with some huts and two weatherboard cottages set against the rounded hills and fields of flax. Richard started there, assisting with morning school and helping take care of the infants [Ramsden 1936: 204-6; Mellersh 1968: 164]. He would marry a daughter of Mr. Davies, another missionary [Fitz Roy 1839: (2)605]. 187 The actual text here is "on board." 188 Fitz Roy calls this a blue shark (Glyphis glaucus) [Fitz Roy 1839: (2)618], though it would have been very large for that species. It was more probably a whale- or checkerboard-shark, Rhincodon typus. Unlike the blue, this animal is quite harmless, its large flat mouth capable of feeding only on plankton. Whale shark can grow as long as 45 feet (13.5 metres). Most sharks give birth to live young, but the whale-shark lays eggs 2 feet (60 cm) long. 189 In a bilingual service at the little chapel at Paihia with the organ Covington describes. Darwin, the late aspiring Churchman, thought the service would be better run if it were only in English [Barlow 1933: 372]. The Church Mission Society, contrarily, was creditably anxious to teach in the Maori language; the next year a small press at Paihia printed a Maori New Testament [Elder 1932: 523].